It’s time to swap those tennis shoes for dancing shoes as Naas LTC proudly presents the side-stepping, toe-tapping, footwork event of the season! STRICTLY COME DANCING ! ! ! 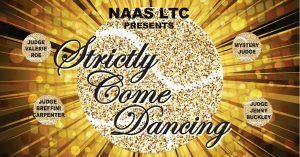 28 of our very own club celebrities, 14 men and 14 ladies, will be strutting their stuff on the dance floor in the Citywest Hotel on Friday the 15th of March in the hopes of becoming Naas LTC Strictly Champions. Four fabulous judges Valerie Roe, Jenny Buckley, Breffni Carpenter, and one very special MYSTERY judge, will cast their expert eyes over their routines and be on the lookout for any foot fault! Hosted by TV3 Presenters Andrea Hayes & Conor Clear at Citywest Hotel, this glitz and glamour fundraising event is being organised with the aim of raising money for some sparkly new paddle court facilities at the club, as well as a truly wonderful charitable cause. Stay tuned for more updates as we announce our Tennis Dancing Couples on Friday the 8th of Feb! Once paired, they will have just 5 weeks to rehearse before performing on stage for both the judges’ votes and the audience’s votes. Follow us on Facebook and on Instagram @ltcnaas for behind-the-scenes action and let’s cue the music!